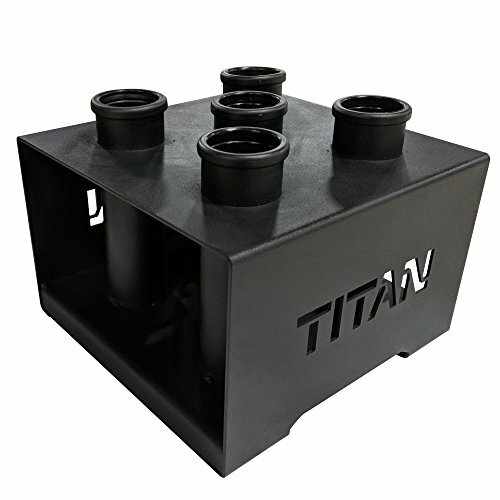 The Titan Fitness Olympic Bar Holder is the best way to store your dumbbell bars in-between usage. If you want to maintain a clean and organized space in your gym or home workout space, simply place your bars inside the sleeves and slide them all the way in. Safely keep up to 5 of your Olympic bars, EZ-bars, or trap bars off of the floor. - Bar hole diameter: 2"
Compatible: Holds bars with diameter 2" or less, including Olympic, trap, squat, bench press, dumbbell etc. Very Durable: Heavy 9 Ga. steel tubes, 3 Ga. steel base, and powder coated finish and boxed construction. Safe and Stable: 35 lb holder safely maintains upright positions of bars. High Quality: Precision design, laser cut components, and even spacing. Convenient: 12" square layout takes up very little space and allows you to clean up and organize your gym area.